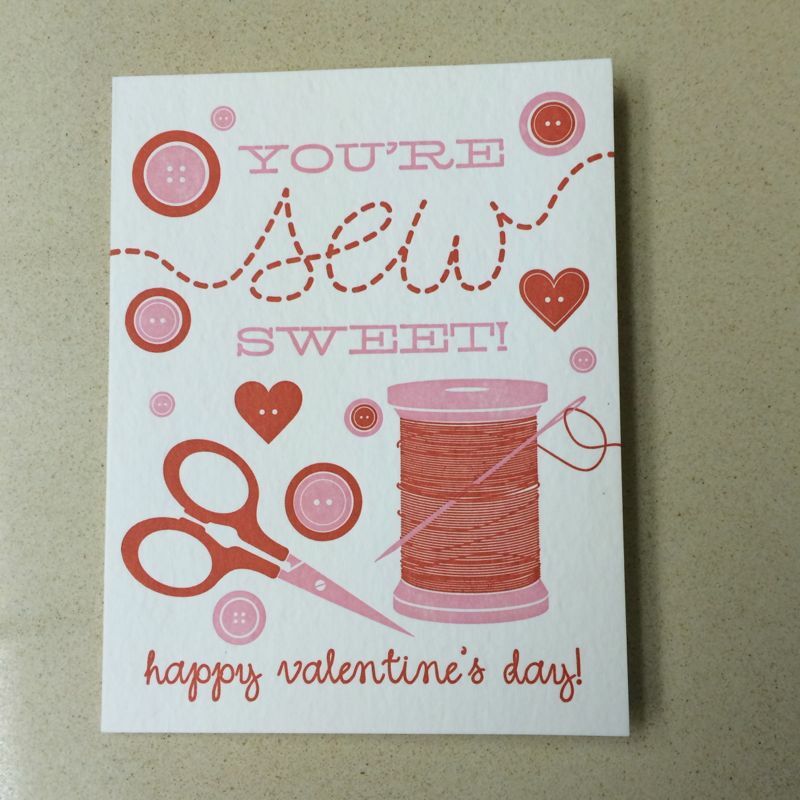 Posted on February 16, 2014 by Elizabeth E.
Well, first, Happy Belated Valentine’s Day! 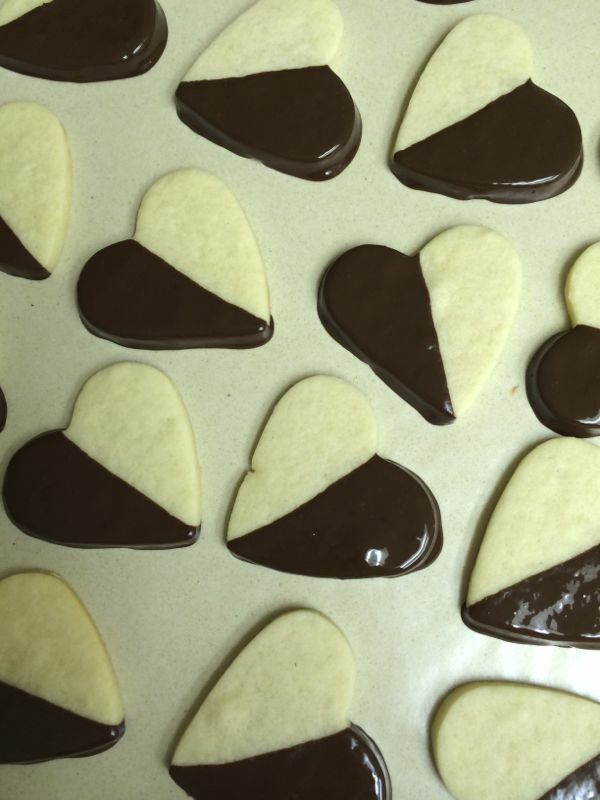 And I made some cookies (recipe *here*) for the occasion. But in amongst the papers that had to be graded and the handouts that had to be written, I wanted some form of Olympic quilt. Something. . . somehow. So I laid out some snips from some recent projects in circles, playing with this layout and the other. So, here it is. Olympic Geese. 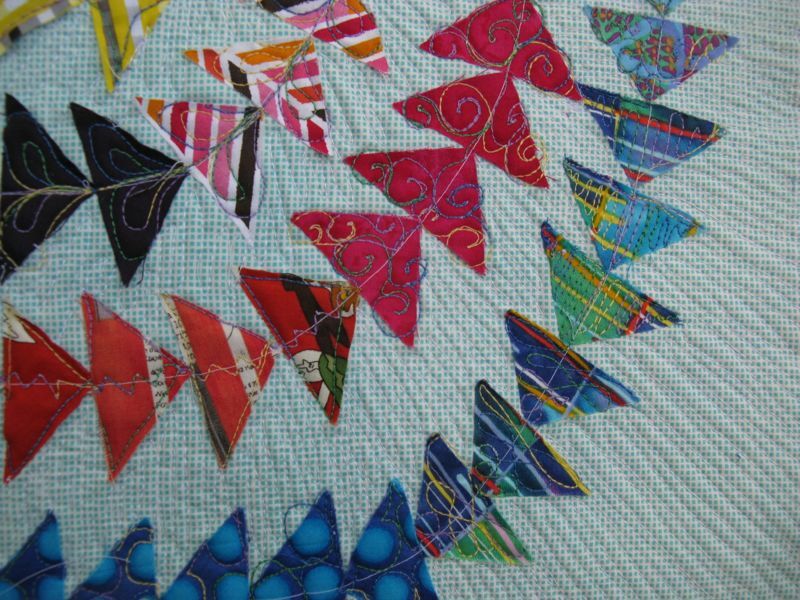 Little triangles flying around in circles. 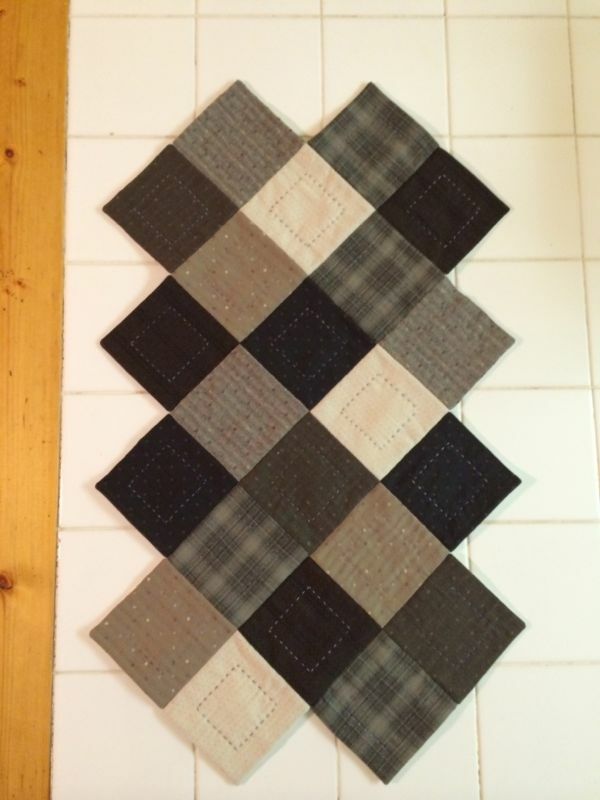 While free motion quilting, I decided to try different ways of tackling the quilting. 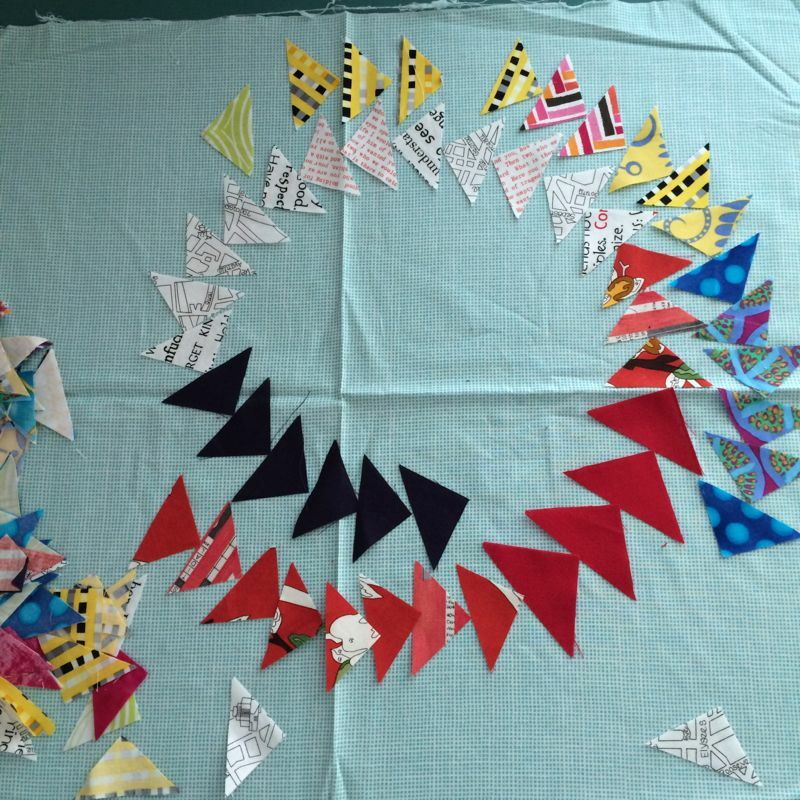 I figured out about twenty different ways to quilt a triangle. A little self-tutoring while goofing around. Then I quilted lines radiating out from the center, close together. While at Road to California, I found a pattern for a bag I’ve wanted to make for just about forever. So it starts out with lots of squares, with batting and backing, then stitched around. This is the interior. I used heavy thread, like a sashiko thread, to create the stitched lines. I then stitched it in rows, then the rows together. Of course, all done while watching the Olympics and cheering on Noelle Pikus-Pace. 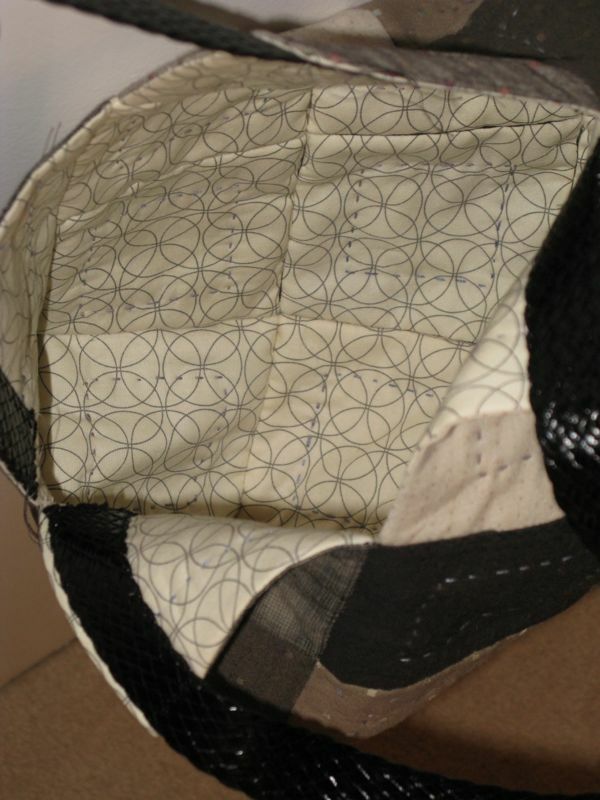 I then stitched the sides together, which about broke my already burdened brain (remember? the grading? the handouts?). And here’s a picture of the interior. 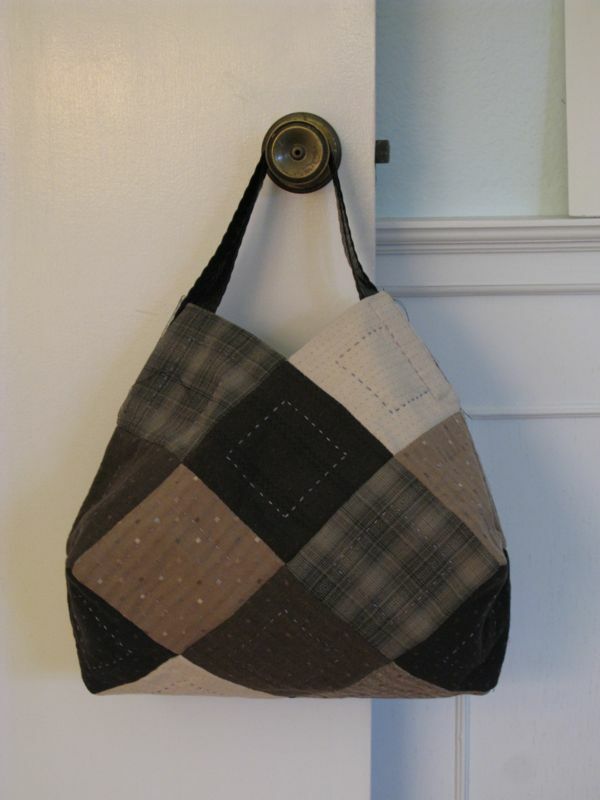 It has woven faux leather handles, which I zig-zagged onto the bag, and will cover the cut ends of the handles with more fabric. It’s kind of an odd shape, but it intrigues me. 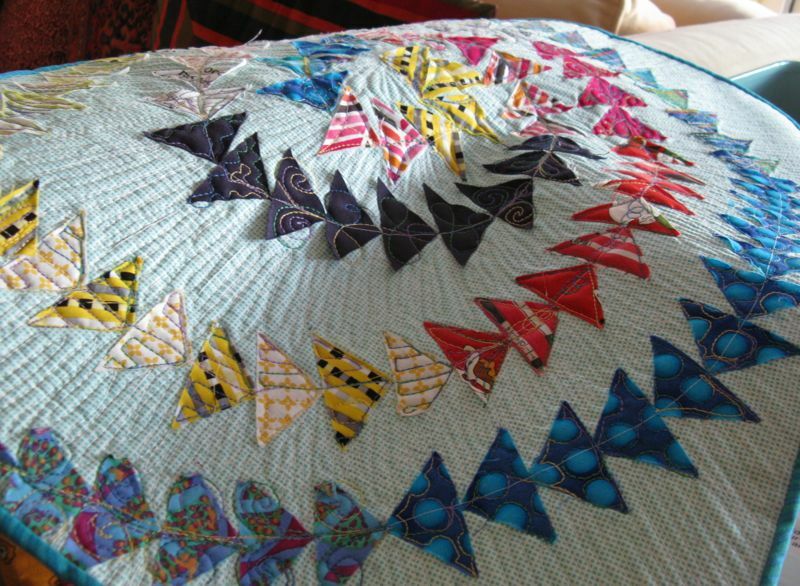 I’ve got to find a way to put it together more easily–this hand-stitching of all the squares together is for the birds. And I think I’d like to try it in bright colors, and smaller squares. And I’d also like to fly around the world, too. Okay, back to grading tomorrow. Then to do our taxes. Who says it’s a holiday? LOL! I love your wish to fly around the world! We all have that one! I have a pile of assessments calling me to, so I have some simple strip piecing ready in case my sewing machine starts calling me! Love both the bag and the Olympic Geese! Those Olympic Geese are so interesting. The quilting is fun. And the bag, it looks so complicated. Great fabrics. My golly, but you’ve been pretty busy with all these fun, different, interesting projects! I love the bag!!!! That looks great. The geese do remind me of the Olympics. 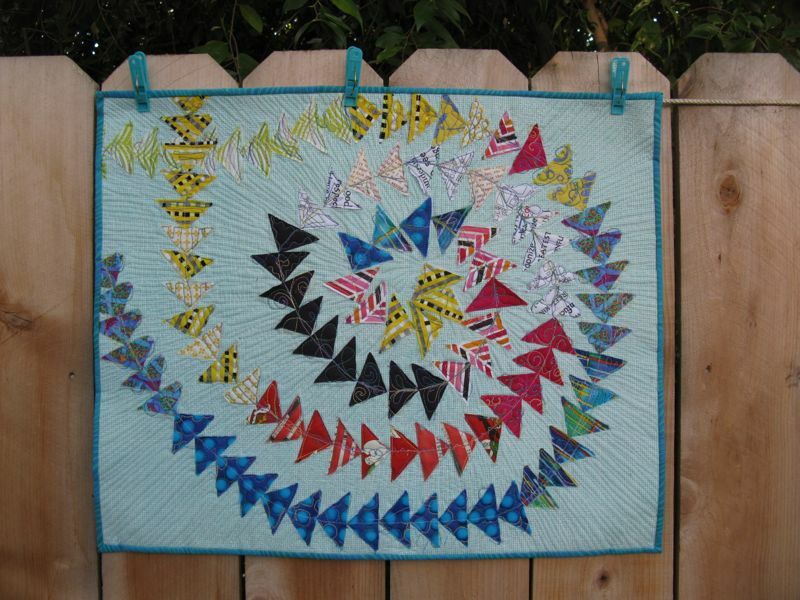 Great idea and a terrific quilting pattern. “So, in my free time over the weekend, I just whipped up this fabulous little quilt and a new bag for myself.” You are amazing. Uh-MAY-zing. You have art quilts nailed! What an olympic beauty. I award you the gold medal! Very impressive! Those geese flying around are truly wonderful. Your flying geese seem to be flying around the world. I’m very impressed. Quilt yourself some wings and take off! 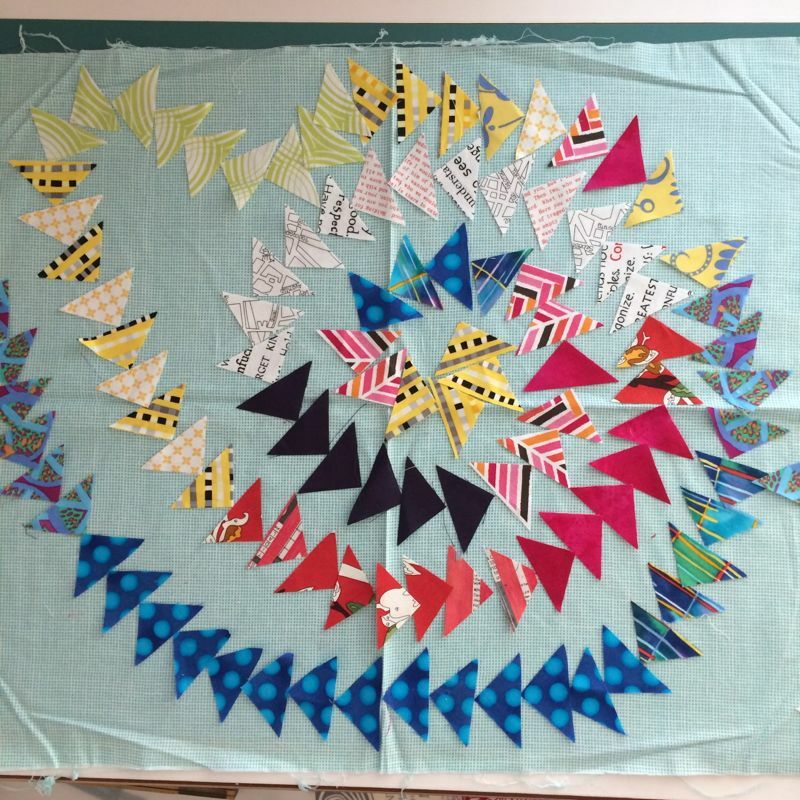 The Olympic quilt is a wonderful project. Just a bit to take your brain off other stuff. The bag is fantastic. 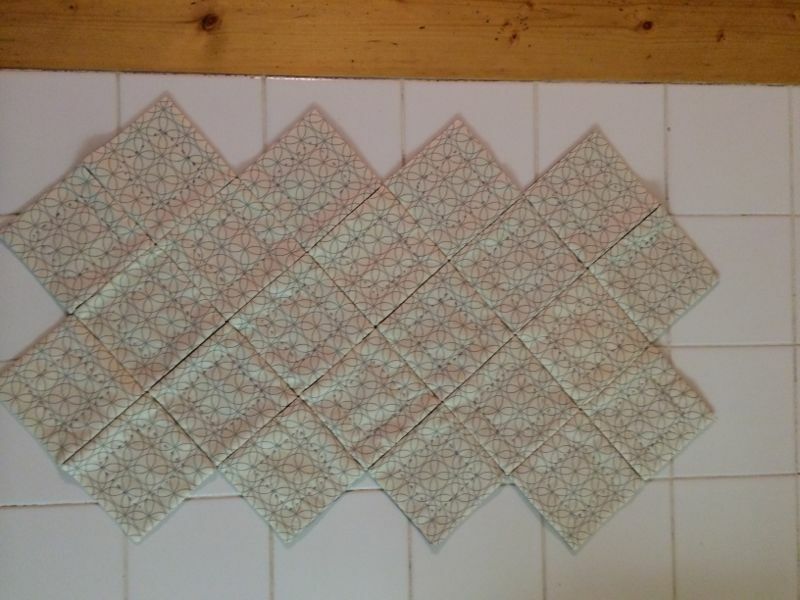 What is the name of the pattern. I would like to make one, too.